Back in the mid to late 1970's, Alton Towers was a bustling attraction, with a fun fair in the grounds of the Towers. John Broome, then Managing Director of Alton Towers Ltd, decided that he wanted to make the park into a new style of leisure attraction. Then back in late 1979, 68 containers were shipped to the UK, and transported to Alton Towers. Inside were massive steel structures which would change the fate of the park forever. 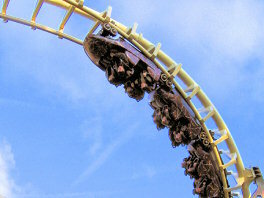 The Corkscrew was an Arrow design coaster, manufactured by Vekoma, and cost back then £1.25 million. The ride had very little changes over its 28-year lifespan, apart from some new trains in the mid-nineties, and a bit of a theme applied to it in 1999 when Ug Land was created. Despite the spruce-up, towards the end of its life the Corkscrew showed its age, and people complained of the uncomfortable ride it offered. It was closed to make way for a new roller coaster in 2010, which will occupy the space left behind. On boarding your car, you noticed how small and cramped they were. The train would leave the station, up the lift hill. The lift hill was quite high, and gave views of Alton village below. A quick turn and dip to the right increased your speed significantly, and took you into what was the best part of the ride. The first drop was fast and steep, leaving your stomach somewhere a few cars behind. A fast helix took you into the double corkscrew, and the on-ride photo. The rest of the course was pretty nondescript with a couple of minor drops, and fast turns, but it was all just a little too average to enjoy. Also, by this time, your head had been jolted around so much, that you may just have had a headache for a few minutes after leaving the loading station.